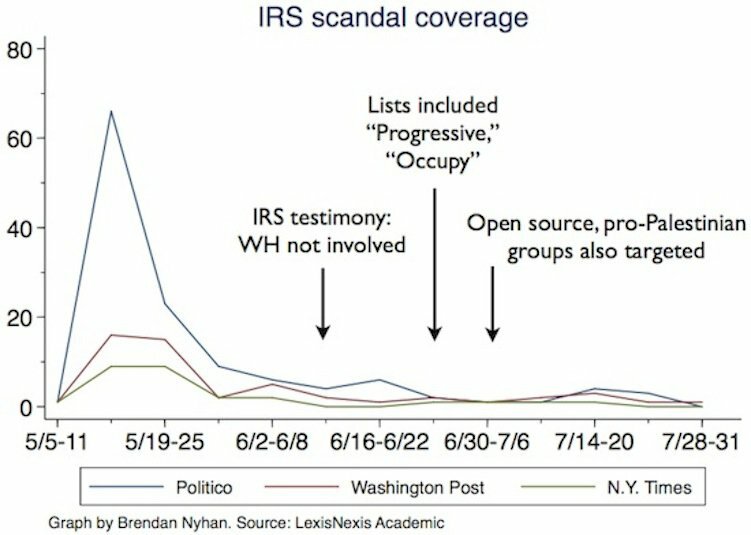 Earlier this week, I noted that it was odd for conservatives to be lamenting that the IRS scandal had been allowed to slip away, when in fact they had won this whole round. 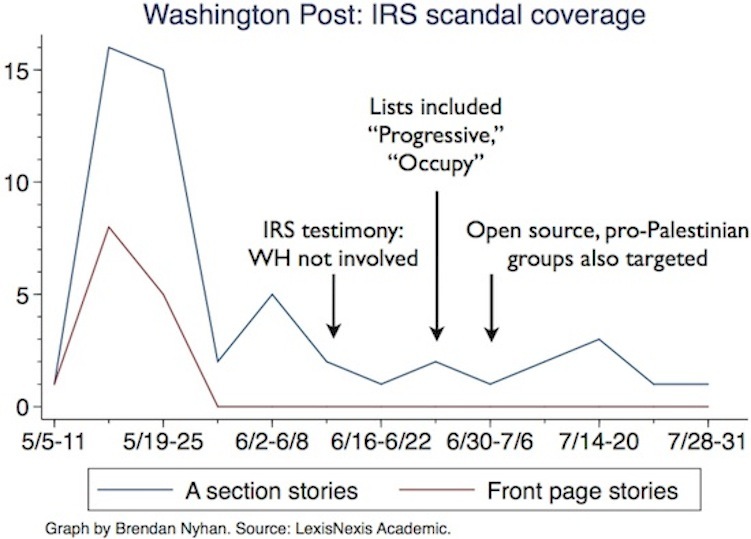 There had been a huge explosion in coverage in May when the revelations first appeared, nearly all of it making them out to be evidence of a grand Nixonian conspiracy to silence grass-root conservative groups. This explosion in coverage inevitably took its toll on the Obama administration—Obama’s personal approval ratings on characteristics like trust and honesty dropped sharply—and on the IRS, which has not only seen its own standing drop in the polls, but which has seen no shortage of employees disciplined or tarred. Meanwhile, the story has faded from the headlines exactly over the time period when more and more evidence was emerging that the conspiracy wasn’t nearly as grand as first believed—in fact, that there was no conspiracy at all. That is, it has helped conservatives that the media turned away when it did—after the damage had already been done. Well, now comes an actual political scientist with data to back this up. 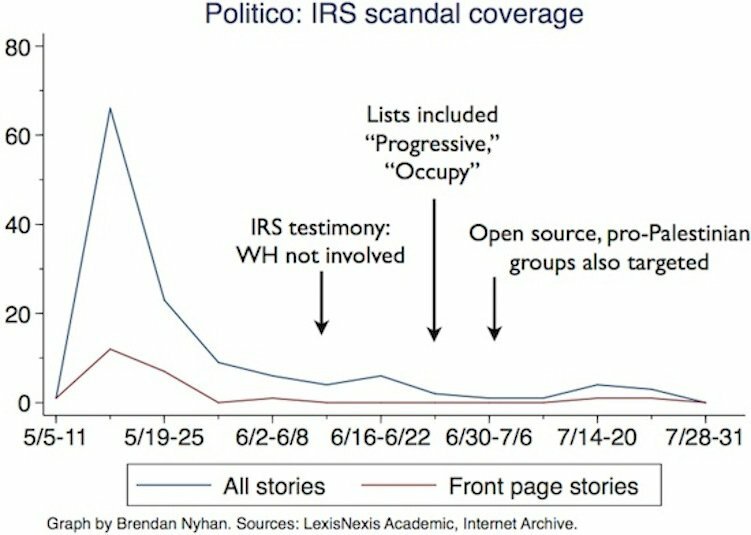 Dartmouth political scientist Brendan Nyhan went back and examined the coverage of the story over the past few months and what he found reads like an EKG of Beltway scandal mania—a huge spike in saturation coverage followed by virtual flatlining, even at the points where new, exculpatory evidence was emerging. One outlet—take a wild guess which one!—emerges in the numbers as particularly excitable and feckless. Now, it would be one thing if there really had been nothing to suggest at the outset that the initial framing of the story was wildly exaggerated. But there was. 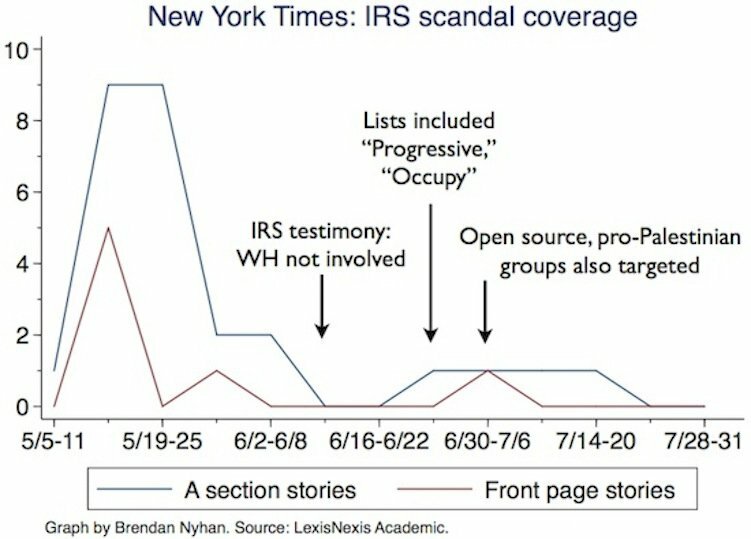 For one thing, a few of us noted right from the get-go that it made no sense for the IRS to be deliberately targeting small-fry conservative groups for Obama’s political gain while letting sail by, as they did, the huge fish who were actually having an impact on the 2012 election, such as Karl Rove-founded Crossroads GPS. But such context did nothing to stop the mania. As is always the case, there has been no formal reckoning since by the reporters and editors who engaged in the mania. The carnival moves on to the next town, blithe and oblivious as ever. All we have in the way of accountability is these remarkable and quite damning graphs.